I have a 2D level that I have built in my map editor, and I was wondering the best way to create a collision map for it. I was just wondering how I could take my node locations and convert it to a collision map for Unity. Thanks! I feel this has to be able to be done, I can think of how I would do it in flash... but I am not sure how to manipulate it in Unity. I thought since these types of questions seem to show up now and then I'd explain myself a bit more in detail. 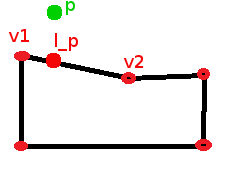 What we want to do is check if point p is below the line, in which case we have a collision at l_p. To accomplish this we interpolate v1.Y and v2.Y value to check the height of the line at p.X. If this l_p.Y is larger than p.Y then there is a collision. IMPORTANT: If you apply an impulse to the body at this point make sure to check that there is actually a closing velocity ie that there is a velocity pointing downwards in this case. Otherwise you might get another collision reported next frame sending the body downwards again. Not the answer you're looking for? Browse other questions tagged 2d collision-detection unity or ask your own question. 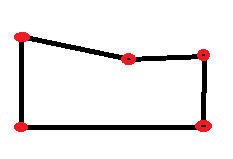 Box2D: Efficient method to create b2Chainshapes for a tile-based map? How do I merge colliders in a tile-based game? How to get a 2D vectorial terrain from an image for Java collision detection? How can I create a custom MeshCollider for my object, or fix my collision problem?